Research has suggested that approximately 4% of the workforce is severely dyslexic and a further 6% is mildly to moderately dyslexic so it stands to reason that most organisations will have employees who are dyslexic or will have additional needs. There is still a stigma attached to the term dyslexia, which is why so many employees don't disclose for fear of being 'found out' and losing their jobs. As a result you won't unlock the true potential of your workforce, increase motivation or productivity. 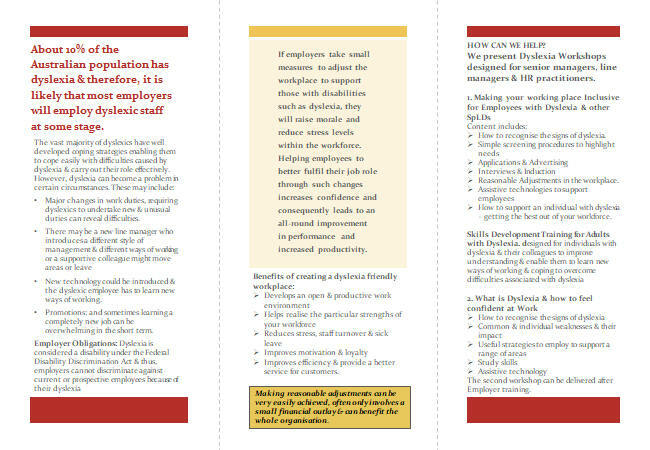 There are many quick and cost effective adjustments and accommodations an employer can provide to make the workplace fully inclusive. A, 2 hour training session may be all you need to help you make those changes and for everyone to reap the rewards. 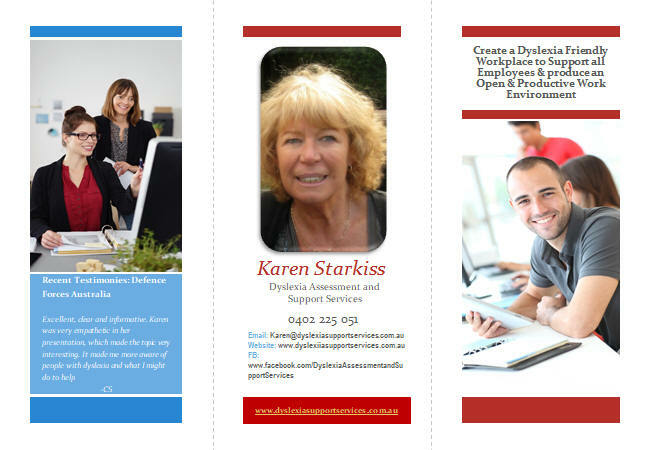 Download our flyer or contact us on 0402225051 to tell us your needs and to find out more. Karen from Dyslexia Support Services Melbourne presented at MLC Life Insurance in Melbourne on the topic of dyslexia to a mixed group of life insurance team leaders in January 2018. Karen’s presentation, which I also attended, was incredibly well received by the group of predominantly young managers who took away a greater understanding of how to identify and manage dyslexia in the workplace. The presentation was highly informative, engaging and fun owing to Karen’s passion and vast knowledge of dyslexia. Karen also had a one on one consultation with one of our team members who was diagnosed with mild dyslexia following the group presentation. She recommended some effective but simple coping strategies to enable the team member to best manage her symptoms. I would highly recommend Karen to any large business or corporate and would happily have her back at MLC in future years to come.